Looking for an experienced website & marketing copywriter? If it talks to you, then talk to me. I’m Jim, a London-based copywriter. You need to promote your brand, increase sales, or convey an important message that requires your target audience to take action. Perfect! It already looks like we’re a great match. My copywriting services and 'big ideas' can help you achieve that. What kind of copy do you write, Jim? Most of my clients include start-ups, marketing agencies and SMEs, but I also occasionally work for large corporates too. I charge in relation to the size of the company, the complexity of the job and the time it’ll take. But don’t worry, I'll give you a good idea of cost when we very first speak. I'm 100% committed to providing you with the best value for money and biggest ROI. In a very squeaky chair, at an oak desk in a cottage in Twickenham, Greater London. Most of the time I work from home, but I'm happy to work in-house if required. Got any biscuits? Why should I hire you, Jim? You're invariably selling something, right? One way or another I've been doing that for more than 30 years. My copywriting and marketing services have helped many people to become wealthy. I adhere to AIDCA selling principles, but sometimes we need a bit of fluff, so I do that too. As long as we remember that we're essentially solving a problem for the reader, we're all good. Do you have any copywriting success stories? The shop interior and fitting company who needed a huge boost in sales. 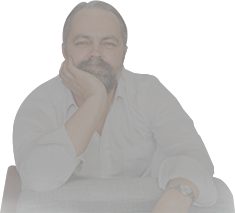 He invested £1,000 in my copywriting services and yielded £300k in fewer than nine weeks. The top London-based record producer who needed more bookings. I wrote his website content. He experienced a 75% increase. The eBay seller who wanted more orders. I produced product descriptions that yielded an immediate 12.5% lift. The building waste disposal company who wanted bigger contracts. A press release resulted in them winning a major multimillion-pound international contract. I'm not sure what I want, or how to write a brief... can you help? Happily! Just book me for a consultation and we'll work it out. Plus, if we have time I'll also give you some of the best marketing advice you're ever likely to hear. I can usually come up with an idea on the spot that'll enable you to increase sales by at least 10%. That's before I've even written anything. Try me. I know what I want. How should I brief you? 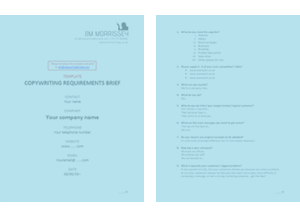 If you're absolutely sure, just scroll down and download the briefing template, then fill it in and email it across. If you’re good to go, we need a plan. or quickly send me your details.